Speaking about hobbies. A list of popular hobbies. Picture-description matching exercise. Phrases to talk about likes and dislikes. This downloadable worksheet is best suited for high school students and elementary school students at Pre-intermediate (A2) level. It is excellent for improving your pupils' Speaking and Reading skills. 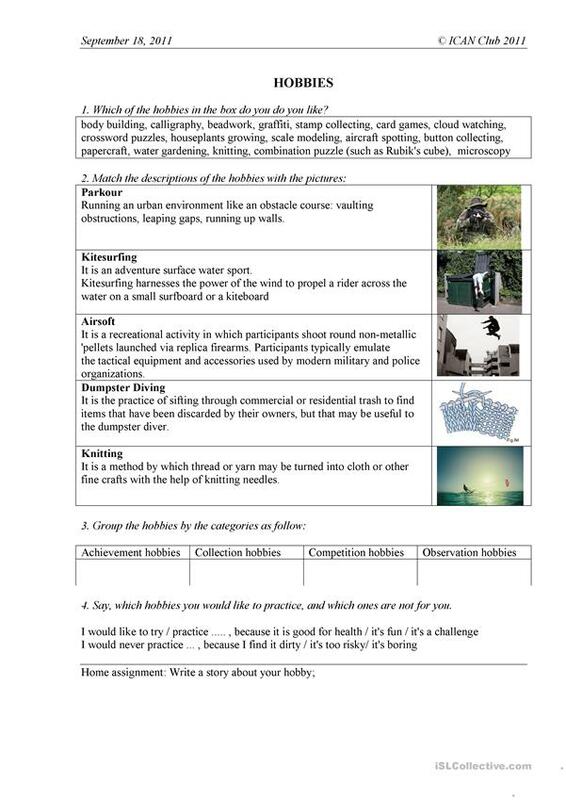 It focuses on the theme of Hobbies. ValentinaH is from/lives in Belarus and has been a member of iSLCollective since 2011-10-22 21:57:44. ValentinaH last logged in on 2019-02-04 02:09:01, and has shared 1 resources on iSLCollective so far.